Thanks for your interest in supporting the work of the Performance Poetry Preservation Project! You can make a donation below. Welcome to the P4 family! If you donate $50 or more to any of our campaigns P4 will send you a free spoken word CD, by one of the powerhouse legends of the poetry slam scene. 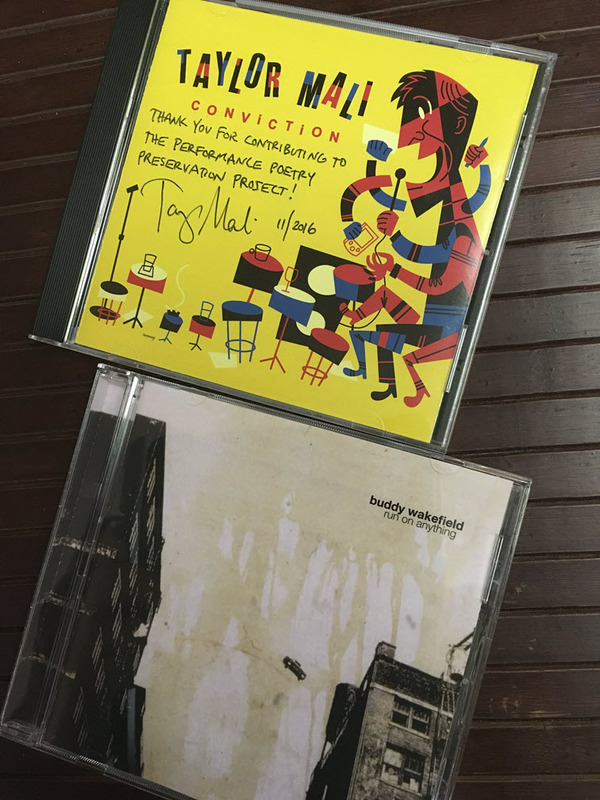 For a donation of $50 or more, you may select either a copy of Taylor Mali's 2003 album Conviction, or Buddy Wakefield's 2006 album Run on Anything! Taylor's powerful work has been a mainstay of the performance poetry scene since almost the beginning, and his dedication to capturing and preserving the performances of the poets that crossed the stage of the Urbana Slam in New York City is legendary. Buddy's voice has become a defining inspiration for a new, emerging generation of poets, and he has toured and performed all over the world with shows that draw rock-star like audiences. Both of these poets are huge supporters of P4, and both have donated copies of their albums as premiums for P4 donors. As a special incentive, Taylor has been kind enough to autograph all of his albums! For a donation of $50 or more, you can have your pick of either album. For a donation of $75 or more, we'll send you both! We'll contact you after your donation to gather shipping information. Thank you in advance for your generous contribution! Note: As of October 1, 2018, P4 is no longer a non-profit 501(c)(3) corporation. So unfortunately, donations are no longer tax-deductible. Learn more about our decision to relinquish our non-profit status here.